There’s no denying it: we love Google+. Sure, we’ve made hay over other social networking sites like Twitter, Facebook, and Pinterest. That’s because it’s smart to be where your audience is … to engage them there, and then direct them back to your own digital property. But Google+ is something different. It’s why we’ve gone out of our way to teach you how content creators can build authority and an audience on Google+ … the critical role Google+ plays in authorship and online visibility … and why it’s the best social site for content marketers. Now let’s get down to the quick and dirty and teach you how to create Google+ posts that get attention, shared, and comments. 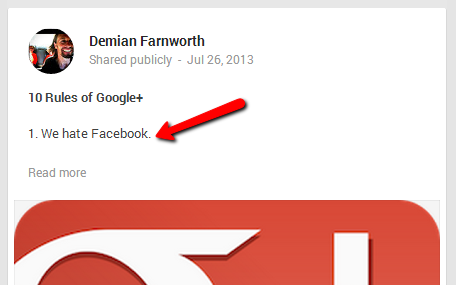 Since November 2012 I’ve put in a strong effort to get my personal Google+ account off the ground. And in that time I’ve put a few notches in my belt. Now, there are some people on Google+ who have way more followers and get way more shares … but after months of toying with G+ posts (including on our Copyblogger Google+ page), I’ve reached a level of success relative to the 3,000 plus followers I have. Not bad for a white, skinny kid from Illinois. So, please trust me when I say I know what I’m doing. You might wonder why I started with the image and not the headline. Here’s the deal: Google+ is a lot like a blog, but it’s also a lot like Pinterest where the image rules. In fact during the last major update with Google+ Google made changes that support large, gorgeous images … going as far as allowing some images to stretch across the entire screen. Now, this doesn’t mean you have to find the image first. You just have to realize how important it is. I’ve done enough informal, personal tests to conclude that an image can make or break your post. Of course you can follow some popular photographers on Google+ like Beau Kahler, Thomas Hawk, or Micaël Reynaud. You can also check out a list of suggested photographers or suggested graphic designers to follow. Keep in mind when using photographs or images: always ask permission and give credit. In some cases, like on Flickr, you can find images by artists who’ve chosen to share by Creative Commons rather than a conventional copyright. However, let’s say you simply have to write a two-line headline. If that’s the case, then your first sentence must be killer. Stephen King is said to agonize weeks, sometimes months over the opening. You don’t have to do that, but it demonstrates the importance of the opening. A good opening will get your post read. A bad opening will get your post ignored. Get rid of the first paragraph. Most of the time the first one hundred words you write are sacrificed so you can get to the point. Consider those words warm up. Type out a list of great first lines. Make this a long list. Grab a list of the 50 best opening lines of movies. 100 best lines from books. You can even loot some of the best opening lines from rap songs. This will get you to concentrate and absorb the elements of the sentence. Review your list every time you write a first sentence. 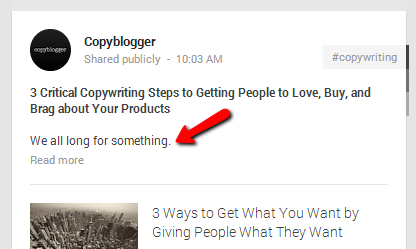 Just like in copywriting, your first sentence is one of the most important elements of your Google+ post. And the guidelines that apply to writing blog posts that Google loves applies to how you write your Google+ posts. Bold: Use asterisks around a word to bold it. Or around your headline — which amounts to the first sentence of your post. Italics: Use underscores around the word/s you want to italicize. Strikeout: Run a line through a word or sentence (strikethrough) by putting hyphens around that word or sentence. Bullets: If you want a list to stand out in a Google+ post, hit your space bar, enter a hyphen, and then hit your space bar again. This is primitive, but it works. And keep in mind: you can always edit your posts once you publish. Furthermore, this isn’t Twitter. Slow down on the hashtags. Besides, Google can actually predict hashtags for your Google+ posts based upon the content. 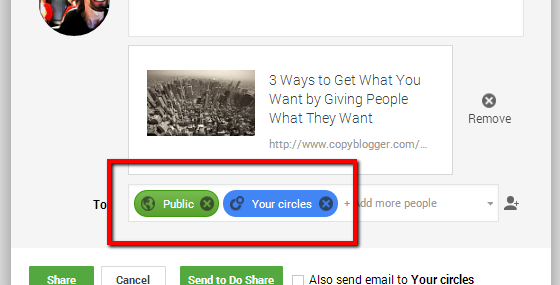 However, Google allows you to segment your audience with specific Circles. For instance, I have Circles for Copyblogger, AgentPress, and Clevers. The subjects I share with each Circle is specific to that audience. Circles allow you to build audiences around a common interest instead of blasting your entire stream with your passive-aggressive religious, sports, or political rants. Instead, segment your all-together-very-righteous rants for Circles dedicated to religion, sports, or politics. Your followers will love you. Maybe. Share niche ideas that might not float on your blog. Write responses to other people’s Google+ posts or online articles (don’t just share a link … write a commentary). Test new ideas on Google+ — then re-create on your own blog. Treat it like a travel journal. The one thing you shouldn’t do is treat your Google+ account like a stand-alone blog where you bail on your personal domain. That’s a huge no-no, for reasons I talked about in this post. I hope you’ll follow us on our Copyblogger Google+ page, and have fun posting! You put a lot of work into this post with all the thought, useful links, and media. A very strong and useful article. I do confess that I struggle with my G+ posts, only sending them out to promote a new post. And, when doing that, they aren’t great. I usually paste the title of the article and a significant section from the post. Very little work goes into specializing it or gearing it to the audience specifically. Part of the reason for that is I hadn’t really thought about how to improve, so your article comes at a good time for me. I am getting quite a bit of traffic from G+, and in my mind, it’s the most important of the big 4 from a blogger/business point of view. So, I would like to improve on that by applying your ideas. David Sedaris is one my favorite writers period, and he does have gem opening lines. I think I will start there, trying to do better in hooking and engaging my audience. Thank you, I kind of like the name, too. That’s an interesting comparison (between Sedaris and Hemingway). That’s never occurred to me, but I do see similarities in writing styles now that you mention it. Your opening statement becomes even more important in Google+ simply because you have a very tight field to make a point. You don’t get a second or third sentence to keep people pushing forward. Depending on how long your first sentence is you might not even get to the point of you aren’t careful! Great post! I think that every single point mentioned can be extended beyond just G+ into best practices for content on almost any medium – great images and headlines can instantly draw even an uninterested crowd into an article, while organisation of the rest of the articles/post will keep them there. This is true: effective copywriting is based upon fixed principles that extend across mediums, platforms. Many Thnx for the tips. I just started using it and see a few people have added me to their circles. The main key is engagement, the more interact with people the more exposure you get. And I just realised that the post thumbnail are all dofollow links so make sure you don’t remove the thumbnail it’s a good backlink. Yes, when you drop a link into the link field, it is a do follow. When a link is dropped into the body copy, however, it is not. Glad you enjoy, and engagement is the key. Thanks for breaking down how to write a great Google+ post. This reminds me of the phrase, “You don’t always get a second chance to make a first impression.” Writing an opening line can be a challenge, which is why I like to write mine and then it sit for a while. I’ll revise it, if necessary. I’ve been purchasing my images from stock photography sites because I don’t want to violate a copyright. However, I will check out the sites you listed and seek permission when I find an image that is appropriate for my blog post or Google+ post. Thanks for the tip! You can also take your own pictures, too. I’ve seen some nifty images from amateur photographs that are beefed up with filter treatments. Don’t forget to save some money for good lights as good lighting can overcome a mediocre camera. Lynda.com has terrific tutorials and is well worth the yearly pirce to have access to thier quality videos. When I bought a combo video/ SLR camera last year, Lynda.com had a 2 hr tutorial on my specific model that was better than the one the company that made the camera put out. Another great resource is the staff of B&H Photo in NYC. Their on-phone staff are VERY helpful and will tell you that you don;t need to buy X or can tell you what’s the best deal for your budget. They’re not open however, on Saturdays or on high holy days. I’m never disappointed when I read something in here. I come, I read, I learn and then I share. What else can you do when the content is so valuable. WOW, what an awesome post Demian! My mind exploded with tons of ideas to boost and improve my google plus posts. Especially what you said in your conclusion. I’ve never thought of testing some topics and niches on google where you can get spot on feedback from your engagers. Thats a great idea to help keep your blog relevant to its readers! Demian, an immensely useful post here. Also, I was born in Illinois and am sometimes skinny and always white. We have a lot in common. That’s an interesting idea. I have not tried it. My guess is it will work, given Google crawling G+ posts instantly. i’m surprised you didn’t mention communities. I was never a big fan of the “circle system” but G+ communities, changed a lot of things for me. Thanks for this Demian. I’ve been puttering around with G+ since it started–and I like it–but I haven’t had any sort of plan. This gives me some great ideas that I need to come back to. Also, I haven’t thought of segmenting people into circles that I *post* to. I just have things organized into what *I* want to see/read and grouped into circles based on my interests, not theirs. Brilliant. Have to check it out. Also, this was bugging me (I read this earlier), and I’ve had that old song “Dirty white boy” in my head all day as a result. Just curious: why the choice of adjective order in this phrase: “white, skinny kid?” I’m positive there must be a reason, knowing your background as a writer and that it probably went through multiple edits here on CB. A skinny kid who is white…skinny versus chubby? Usually when there’s a reference to white boy it’s about…white boy. Color. Or if a girl it’s “dumb white chick” or similar, at least here in the Philadelphia area. It’s always “white person” with choice of adjective before. But with the changes in average weight in the nation…or I don’t keep up with trends. Enlighten me? Nothing more than I don’t have any talent. And people don’t expect much from Illinois. Vanilla guy, and that has nothing to do with color. It just means I’m plain. Demian, Wow! Great article. Can’t wait to start putting this to work. I have loved your posts on Google+, and I am convinced I need to start using it more often. I am confused about how you find people to follow and how they follow you though. For example, I may write a great post, but who will see it if I only have 30 people in my circles total? Any tips to that? Will my posts be able to grab more people’s attention, or should I be joining groups? Yep, start following influencers, commenting on their content, dropping their names in your content. Get on their radar. The thing I don’t like about Google+ is whenever I use it I feel like I’m disconnected from the rest of the internet. Google+ has gone through soooo many changes since it came it – if you take about the Google aspect of it, Google+ is basically a startup. 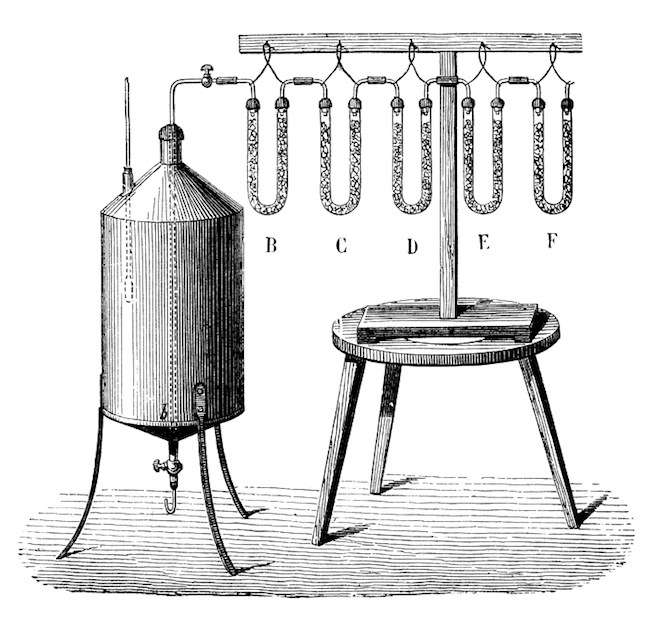 Another thing that thwarts me away from Google+ is the whole platform is done from an engineering perspective. It just don’t feel social. Google has always had a hard time being social – they are engineers, which are generally not the most social people. I want to like Google+. I really do. But it just doesn’t feel right. Do you have an idea why it doesn’t work for me? I think Google Plus is certainly one of the most important networks to have a presence on considering the tie in across Google’s platforms and services. I noticed the image being stretched across the screen from your first point and this has actually made me stop scrolling on the feed to take note of it on a number of occasions because of the volume it takes up on screen. It seems the only bad thing is that to get a dofollow link in the post, you have to use the link option. This stops the ability of having a full size image in the stream. Or am I missing something and it is possible to have both? You are correct: there is no way to do both. One more reason you should not bail on your blog for Google+. However, what I’ve done is shared an article twice. The first time I go for the social share — the spreadability — by using an image. The second time, a week later maybe, I’ll share it again, this time with the link in the link field. I love this post! I have been using Google+ sporadically for the past year, but would really like to get into the habit of using it everyday. I really like your 4 U’s: Unique, Useful, Ultra-Specific, and Urgent. This not only applies to G+ but to all content. Am definitely going to keep this in mind when writing content. True, it applies to all content. That’s why if you master the fixed principles you can pretty much dominate any social network. This is such a rich post. It has everything we need. This is like check list of what needs to be place to make it in the G+ world. 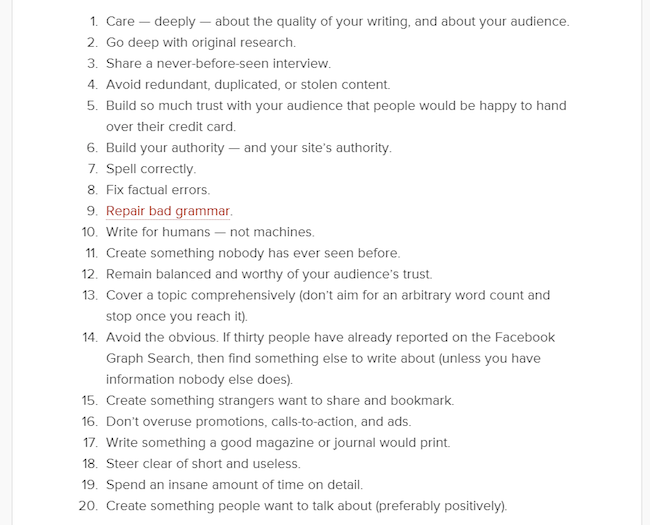 Something one needs to come back to every now and then or have around as a cheat sheet to write useful post. I can safely say that it leaves no room to vague, automated posts. (Name’s cool 😀 Reminds me of Batman’s son Damian). I have started to put more effort into G+, and this post will definitely helpful. There is something I have tried on Facebook that I would love to try on Google Plus. I used to host chat like events on my FB page (the only downside was that the comments weren’t real time, everyone had to reload the page every minute). I still don’t know whether comments are real time on Google Plus. Thanks for sharing the techniques 🙂 I will definitely give them a try! PS: Do we need to include our circles when sharing posts? I usually select public for all my posts. I thought that would make it visible to everyone. Google+ is real time comments. No refreshing needed. And yes, just posting public will share with your audience. Good post and there is a good bit here that I am going to take to heart and start paying attention to. Honestly, my Google+ posts are a scatter gun from the hip affair, and I need to change that. These tips arfe tailor made for me to bullet point on the wall behind my monitor ( just under the most recent dinosaurs my kids have drawn for me ) and keep front and center as I start working to make things happen there. One thing I disagree with is the audience segregation part. Circles are terrible for the purpose of interest based segregation. Circles should be relationship based. They should describe people and your relationships with those people, not interest threaded groups. Family, coworkers, clients, army buddies, high school — these are good circles. Copyblogger is a good circle if the people in it work/write for copyblogger and they are thus a peer group with whom you might want to share information to which the world, in general, should not necessarily be privy. It’s a bad circle if it describes people who are interested in copybloggery types of things. In that case it should be a community or possibly a page if you are making official copyblogger posts from it, but probably it should be a community. Placing interest based posts in a community means you aren’t blasting them out to Uncle Fred and your high school drinking buddies, but that people who are interested in the topic can find them and interact with you on them. If you squirrel them away in circles, you hide them from everyone you didn’t know would have been a raving fan of them. Great distinction, Dane. Thanks for sharing. Your first point really disturbs me because you’re encouraging people to use a screen grab tool. As you mention, the image is critical to the post. Therefore, it has value. So why lead people to believe that it’s OK to steal an image from a a photographer or artist? When we post images online, we do not do so in order to release all rights or credit to some anonymous person on the Internet. I share my photographs using a Creative Commons license that allows non-commercial use – such as a Google+ post – at no charge. However, I require attribution and a link back to my web site. In fact, I post an embedded HTML code to make it easy for people to use my images on their web site that already has a link back to my web site. Screen captures without any concern for the creator is wrong. It’s a shame that your post will lead others to continue the abuse of a creative person’s copyright. People use screen grab tools all the time to make points in their posts. Every image you see in this post (except for the opening one) was created with the screen grab tool Jing. And credit is given where credit is due. You’ve seriously lowered my confidence in Copyblogger. The rationale that it’s OK because people do it all the time is a fallacy, and giving attribution isn’t always sufficient depending upon the image and the creator’s licensing terms. But, hey. You’re going to do what you’re going to do. When I say it’s conventional to screen grab to prove a point, I mean that it is no different than if I was quoting someone. You take someone’s words, give them attribution, and move on. That is an accepted convention. The same with a screen grab. And keep in mind I did throw a caveat out there, one Dane brought to your attention. A quote is a subset of a larger piece. A photo is the entire piece. Your logic seems flawed to me. Informative post. 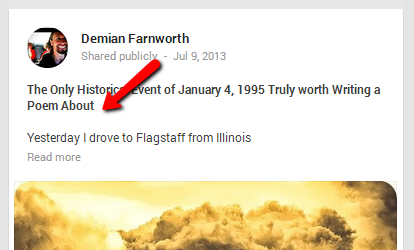 Thanks Demian for providing such a detailed description about google+. This information is really beneficial in using g+ for promotion of blog and webpages as you pointed out every aspect, which we can use to promote out writing on google+. Truly helped a lot. There are many blogs and articles on Facebook and twitter tips but Google+ is a great opportunity that is yet to be optimally utilized. Google+ is on the rise. The one thing I hate about Google+ is that it forces you to connect your YouTube page with your Google+. I for one dislike the new design, but that’s just me. I read another article about Google+ is better then blogging. I not sure myself but I’m glade I’m doing research on it. Thanks for the tips! This really helps. Thanks for this great article. Made a whole Diigo list from the links in it as it is valuable As I bookmark with the flow of the text it is a ready to use ordered list and that’s great! (I’m a hoarder). 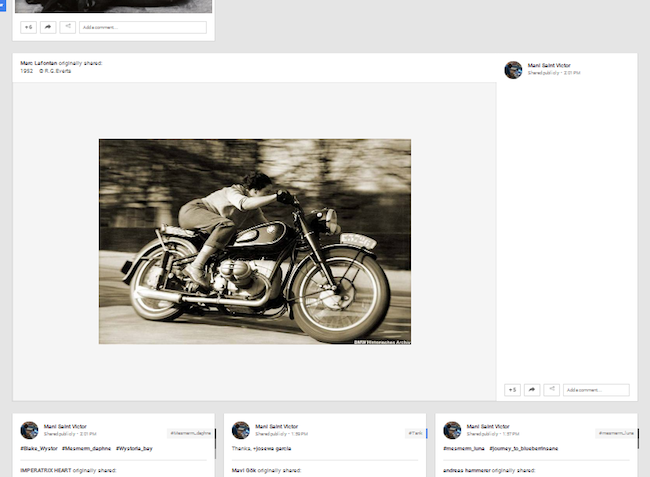 I think it works very well (best) to use very quality and large images in posts on Google+. I know this out of experience, not books. But I also share my blog posts on it’s Google+ page (http://gplus.to/googleplusmarketingblog (I like short urls). I found that if I share an image instead of a link that the response is higher but their is no ripple and there are is no social data available for it in Analytics and ignoring the the CTR trick based on views. Because of this I abandoned the big and beautiful when sharing the link on the g+ page. Some say it can be done with the first link in a image share but I haven’t had time to research it. Now reading your post it comes boiling up like acute bursts of pain in the head realizing that maybe it is possible? Can you make it better? I’ll share posts twice: once with the do-follow link (without the big image) and then down the road with the big image. Best workaround, but I get more mileage out of the post that way. Thanks for your answer and tip. I have discovered that Analytics pics up the shared url also when shared on Google+ as image with a hyperlink in the header text of the Google+ post to the blog post. Downside seems to be that it doesn’t count for social signals like for example Google+ Comments. Great article Demian. Been busy growing my circles and like your comments on the opening line has to catch an audiences eye to make them click. I’ve noticed funny pictures really go crazy with the share and +1’s. Thank you for sharing this post. 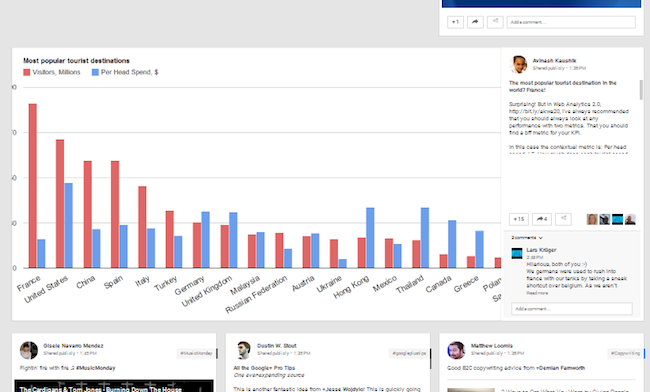 I’m fairly new to G+ so these insights are HUGE for me. Especially the one about the circles (and the religious ranting lol, I tend to be a huge culprit here). I will be re-assessing how I use my G+ account for sure. Epic post you’ve shared with us. 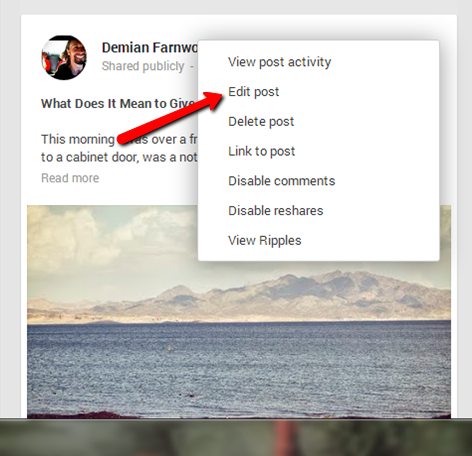 I liked all the tips and ideas for Google+ posts. 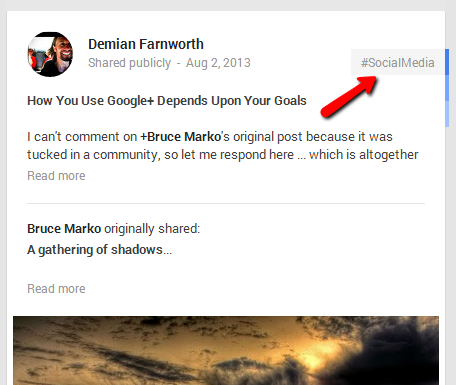 I’m new and I don’t use Google+ more often, but after reading this post I’ll surely follow your tips on Google+! My current “scheme” is to share a post on G+, either by the share button on the actual post or by sharing it through Google+, and write a little more about it. In that case, the post on Google+ will have a little text at the beginning followed by a small thumbnail and the shared post title. So I don’t really understand how you can get the “Read more” link after the first sentence. Do you add a lot of spaces or is it something I am missing? If you have more than three lines of text then the “Read More” should appear. Next time try writing about ten lines, and you should see it. Demain, this is a great post and I love how you pinpointed the effectiveness of a seductive hook. I will definitely start reading David’s material because I want to understand the importance of an effective first sentence. Which stories would you recommend from David Sedaris? Grab “Me Talk Pretty One Day” from your library. The formatting tips were really helpful. 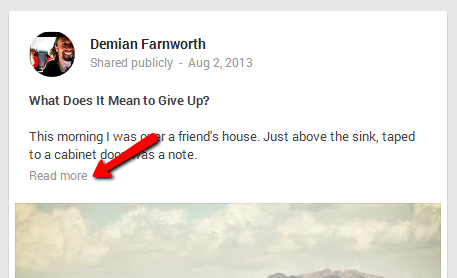 I was under the impression that I was stuck with the default display that Google+ makes. Overall I’m still not happy with G+ , especially the fact that I cannot directly import my clients from other platforms to my business page. Anyone figure out a way to work around this? Right now I’m limited to adding 40 people per day, which I import from Gmail contacts. Getting everyone plugged into my G+ circles in one shot would be amazing… Especially considering it will take 2 years to import them all @ 40 per day. Wow, Demian, what a terrific posting. Each link leads to a page with more meaty links, There must be a week’s worth of reading to digest all of the info. BTW, you have acquired a host of intelligent, insightful followers. This is the first time that I’ve actually read most of the comments on a site. I’ll definitely be back! I signed up for G+ today. This article helped me a lot. Many questions in my mind about G+. But Rome was not built in a day. By the way thanks to the author.